Dates: Thursday, November 7th - Saturday, 9th with optional Saturday night lodging. Doors open 12:00 pm on Thursday and 8:30 am on Friday and Saturday. As we are not set up for Thursday lunch, please eat before coming. Our first scheduled meal will be Thursday dinner at 6 pm. Early-Bird pricing at $25 off all packages if paid in full by October 1. Full package pricing begins October 2. Commuter package rates are available. Terms: Cash, check, or credit card. We accept all credit cards that Square accepts. Phoning in the number is fine. Before September 1: Your monies will be refunded in full minus any applicable credit card charge. Between September 2 and October 1: Full refund minus $150 plus any applicable credit card charge. Between October 2 and November 1: 50% refund plus any applicable credit card charge. From November 1 forward to the clinic start date: 25% refund plus any applicable credit card charge. Note: Paying by check avoids the cost of additional credit card fees if monies are refunded. Here's what's happening at the next NCBC clinic? We have moved to the YMCA Blue Ridge Assembly, a new conference/ camp facility located 15 minutes east of Asheville off I-40 in Black Mountain, NC. YMCA Blue Ridge Assembly website. We welcome the following new instructors to the 2019 NCBC teaching & setup staff: John Boulding, Amy Buckingham, Mary Z. Cox, Maria Fairchild, Cathy Fink, John Lawless, Jake Loew, James McKinney, Marcy Marxer, Billy Presnell, Butch Robins and Bennett Sullivan. Maria Fairchild Performance: When classes end after 4:30 and before dinner on Thursday, November 7th, Maria Fairchild will perform and take questions. This event is a NCBC exclusive and will not be open to the public. Whitewater Bluegrass Performance: When classes end after 4:30 and before dinner on Friday, November 8th, Seth Rhinehart's band, Whitewater Bluegrass Company, will perform and take questions. This event is a NCBC exclusive and will not be open to the public. Cathy Fink and Marcy Marxer Performance: When classes end at 4:30 and before dinner on Saturday, November 9th, Marcy Marxer and Cathy Fink will perform and take questions. This event is a NCBC exclusive and will not be open to the public. Akira Satake is expected to provide a return performance engagement including another question - answer session. Date to be confirmed. On Saturday, November 9th, Marcy Marxer will teach guitar. This is a NCBC first and I'm looking forward to it. All students are welcome to bring a guitar and sit in on Marcy's classes. Warren Yates of Yates Banjos and Tim Gardner of Cedar Mountain Banjos will be on hand to show their instruments and talk banjos. A limited number of full and one-day tuition-only scholarships will be available. These scholarships are meant for those who would like to learn banjo but who do not have the financial means to afford tuition. 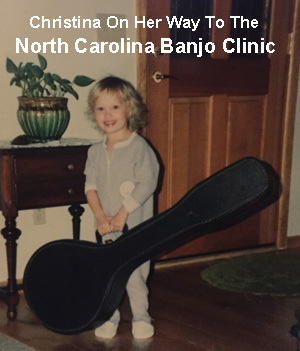 If you are interested in applying for a scholarship, send us an email letter explaining your interest in our clinic, why you would like to learn banjo and why you are applying for aid. Scholarship students will be responsible for purchasing meals. Those wanting to spend the night will be responsible for lodging costs. We have a limited number of banjos available for rent during the clinic. Cost varies per day. If interested, see details on the registration page. Classes are offered in Scruggs and in Old Time/ Clawhammer banjo. Some intermediate and advanced instruction will include Melodic and Single String styles. What will you need? Rent or bring a 5-string banjo, picks, capo, a wire music stand, recording device if you'd like and writing material. Depending on schedule, private lessons will be available during the clinic with the instructor of your choice. It is upon to the student to connect with the instructor during the clinic. Note: To ensure your place on the banjo setup schedule, pre-payment of $35 is required. Introduction to Banjo: No experience?...not quite sure what banjo style to pursue? Clawhammer or bluegrass? Students will be exposed to both styles and taught rudimentary skills applicable to three-finger and to clawhammer. Beginner: Limited experience. May know a few tunes, primary chords, and rolls. Beginner's Bridge: This class will focus on taking beginner students to the next level. Of prime importance will be teaching how to go from picking notes to making music. Teachers will focus on how to connect melody notes with rolls, and timing, in order to play the tune that's in your head. Intermediate: Experienced. Possibly in a band, can jam, understands the basics. Knows a number of banjo instrumentals. Seeks more consistent sound and timing. May have trouble finding the melody. Introduction to Banjo OTB & BGB: For students new to the instrument, this class will provide exposure to both clawhammer and bluegrass banjo music and playing. Students will be exposed to banjo basics including chords and right-hand techniques that define frailing (clawhammer) and picking (bluegrass). Once students decide which style they prefer, the instructor will separate the class and alternate between groups teaching that style. The instructor will cover picks, holding the instrument, essential accessories, basic maintenance, string tuning, reading tab, anchoring the right hand, picking rolls, primary G chords, hammer-ons, pull offs, slides, and timing. This is a tablature and written information class. Beginner BGB: Topics will include developing listening skills, overcoming obstacles, practice routines, developing better left and right-hand coordination, more intricate rolls, left-hand technique, runs, a touch of chord theory, how-to produce better tone, elementary backup techniques, timing, and a few kick-offs and endings. Basic arrangements in various songs will be taught in the Beginner class. Students are expected to know the primary G chords, how to tune, basic rolls, and a few songs. This is a tablature and written information class. Beginner's Bridge BGB: This is where the hard work starts to pay off. For beginner's ready to combine it all, this class is intended to elevate one's playing by teaching the skills and methods needed to begin playing music on the banjo. Intermediate and Advanced Classes BGB: More advanced topics will be covered in these classes. I/A students are encouraged to switch between Intermediate and Advanced Sessions if topics seem appealing. Often, the material taught can be understood and played by Intermediate players. If a class proves too technical, you are always free to switch to another class. Alternative Picking Styles: Though Melodic and Single String styles, usually combined with or as an accoutrement to Scruggs picking, tend to be more advanced, the same principle as described above applies. If a class is appealing, try it. You might be surprised at how fast you catch on. Once you grasp the elements of these styles, a wider path to improvisation opens equipping players to handle note-for-note fiddle tunes. Beginner OTB: Beginning OTB class is structured to accept players already familiar with clawhammer banjo. The basics will be covered as well as technique and tunes. This is a tablature and written information class. Students must bring a capo, tuner and banjo in playable condition. Intermediate/Advanced OTB: Climbing a level above beginner OTB banjo, Intermediate OTB will focus on improving chord and drop-thumb (right hand) technique while exploring the rich tapestry of Western North Carolina OTB tunes. Several regional OTB tunes will be taught. Students are expected to know the primary G chords, how-to tune, basic right-hand technique, and a few songs. This is a tablature and written information class. We encourage all students to bring recorders or video machines. Some instructors do not use tab so getting their lessons on video will help later. a 501(c) 3 Non-Profit dedicated to Music Education. What a great 2 days...thanks for putting on the camp. B.S. The clinic felt very well organized and I really liked having options to go to. K.I. Two days of Banjo Overload...Love it. A.P. Well organized with outstanding banjo talent. E.H. Excellent job. Can't wait til' next year. L.R. Thanks for another musical vacation. K.S. It's bluegrass. Isn't it supposed to be loud? H.D. Check out TNCBC Instructor Banjo Jam on YouTube: "Shenandoah Breakdown"
Banner photo courtesy of Warren Grant.